Pampered Pirate: Tai Chi - A New Food? Tai Chi - A New Food? When I first heard of Tai Chi I thought it was some kind of food from Thailand! Then, when I realized it was some sort of slow moving exercise, I thought of the movie, "Karate Kid" and the karate master doing his movements that made no sense to me. I was sure all those moves were for dramatic effect! It was only when I got the schedule at the gym mixed up and accidentally wound up in a Tai Chi class that I realized what the fuss was all about. After a few minutes into the routine, I started to feel relaxed and focused. I became aware of my breathing, as well as every movement. Keeping proper form and not moving too fast required concentration. So, what exactly is Tai Chi? Well, I've heard it referred to as "meditation in motion", which I think is a great way to describe it! It's a low-impact exercise that coordinates slow movements with breathing and balance. The combination requires mental focus, bringing together the body and mind. 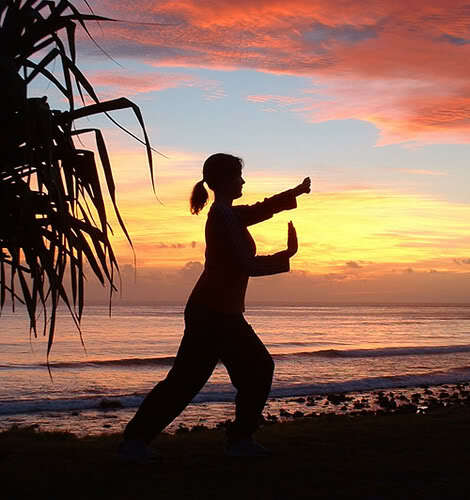 After completing my first Tai Chi routine I felt so relaxed, yet so empowered. The graceful yet purposeful movements combined with the music was so refreshing! I guess I'd say it's kind of like yoga mixed with a slow dance. I felt like I should have been on some beach with its natives from long ago, getting in touch with my mind, body and spirit. So, if you're ever given the opportunity to try Tai Chi I'd say go for it! It's not a new food, and like any exercise routine it has many benefits such as reducing stress, improving balance, reducing chronic pain, and improving sleep.